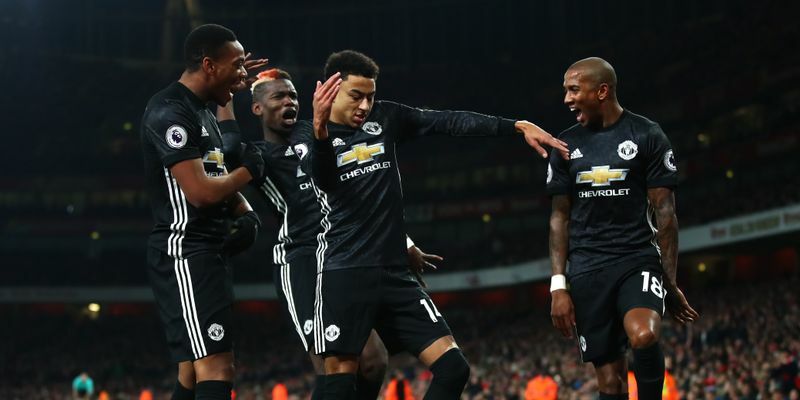 Manchester United won an enthralling clash against Arsenal thanks to a Jesse Lingard brace and a match winning performance from David De Gea, who made 14 saves during the game. Two goals from Eden Hazard and one from Alvaro Morata helped Chelsea beat Newcastle United 3-1 at Stamford Bridge. Even though, Manchester United will miss Paul Pogba for next week's Manchester Derby after receiving a straight red card for a tackle on Hector Bellerin, he had already played his part in ending Arsenal's 12-game winning run streak at home. Antonio Valencia and Jesse Lingard capitalized the some early Arsenal's mistakes as they put United 2-0 up in the first quarter of the game. Arsenal failed to open their goal tally in the first half thanks to some world class saves by de Gea who would finish the game with 14 saves to his name. After the break, however, Alexandre Lacazette gave Arsenal some hope as he halved the deficit in the 49th minute. However, with de Gea making saves on one end, Pogba and Lingard combined to restore United's two goal cushion before the former was sent off for a dangerous tackle on Bellerin. United, though, went on to hold on with ten men and end Arsenal's brilliant home run. Chelsea came from behind to beat Newcastle United 3-1 at Stamford Bridge thanks to their attacking duo of Eden Hazard and Alvaro Morata. Dwight Gayle’s 12th-minute goal gave Rafa Benitez's side a surprise lead but Hazard, who was outstanding in the game, took less than ten minutes to bring his side level. Morata, then, made it 2-1 to the hosts when he scored in the 33rd minute as Chelsea entered the midgame break with a slender lead. Hazard made sure that Chelsea secured their 10th league win of the season as he scored from 12 yards to put his side 3-1 up. The win helped Chelsea rise to the third position on the league table behind the two Manchester clubs. A brilliant counter-attacking Liverpool performance was enough to beat Brighton and Hove Albion on Saturday thanks to Roberto Firmino’s star performance. Liverpool netted twice in the first half of the game and they extended their lead after the break, but Glenn Murray tried to launch a fightback with a penalty but his effort was not enough as Liverpool would go on to score two more goals. Emre Can open the tally for Liverpool which was soon doubled by Firmino and the Brazil striker made it 3-0 after Salah's brilliant assist. Coutinho low free-kick after Murray’s goal, who was the lone scorer for Brighton, restored the two goal lead. The match ended with Brighton’s defender Lewis Dunk heading the ball into his own net. With the win, the Reds have moved into the top four of the Premier League for the first time since August after making it 15 goals in their past four away games in all competitions.